At least I think this is a painted lady butterfly. Correct me if I am wrong. ISO 1000 - 105mm - f/11 - 1/250 sec. Critique, comments and suggestions always welcomed. Thanks. Select download for additional resolution. Needs to shave her legs! !..great download!! Looks good! Love the colors. She doesn't use a razor. Creams them. BEAUTIFUL! You must not live in Michigan. 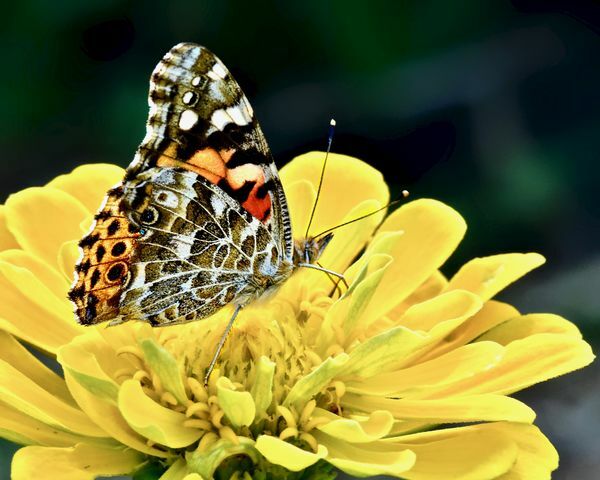 We won't see butterflies for a few more months other than when the Butterflies Are Blooming event occurs at Fredrick Meijer Gardens in Grand Rapids. Thanks for all those thumbs up Annie. This butterfly was shot over the summer, none around here now. I do intend to visit the butterfly garden in our Long Island Aquarium over the winter. They are there all year long!